As a long-life professional potter, I reached a place where my work was becoming very sophisticated and I longed for the simplicity and excitement I’d experienced in when starting out. I went off to Hopi land and spent a month in the desert, determined to make a pot with only what I could find on the land. People had been doing that forever in that place. 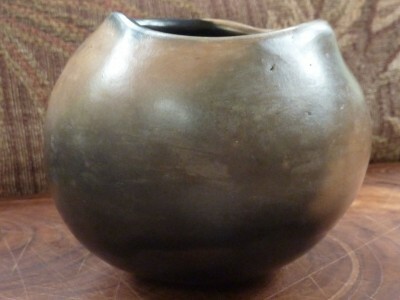 This pot was created by hand and simply fired in a barrel of sawdust. Such simple soft beauty and strength. 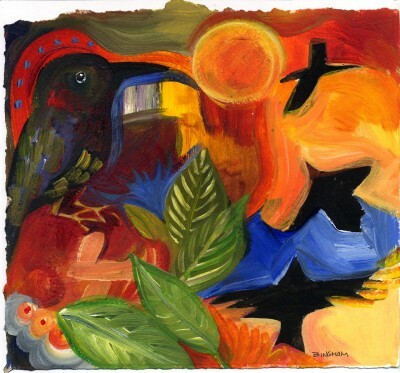 Painted in Guatemala where I needed to use acrylics to meet the energy of the bright strong wild color feeling of that beautiful land. I call it Dawn Messengers and hope it elicits the mood of those first sounds as the world wakes. Nancy Bingham was born and raised in Michigan and emerged creative from the womb. After earning a bachelor of fine arts degree at the University of Michigan, she began what has been a life-long journey as an artist in pottery, sculpting, painting and teaching. She is still living as an artist at age 66. She lives in Washington State’s San Juan Islands and spends part of each year in a small village in Guatemala.